Daylight Savings Time ended this morning, so I hope you enjoyed an extra hour of sleep. Tickets are still on sale for “Black Holes” that will show at the William M Thomas Planetarium on November 15. Then starting on November 16, tickets will go on sale for the traditional holiday show, “Season of Light”. In every show we do at the Planetarium, we include a tour of the evening constellations using the Goto Chronos projector. During the evening sky tour I include a brief display of the effects of light pollution on the sky and then follow it with how the sky would look away from the city lights. The ah’s and sometimes even gasps when we turn down the lights all the way to show the star field in all its glory confirm why we need to talk about light pollution, even if it’s brief. I believe we have an almost instinctual need to see a star-filled night sky. As long as humans have walked on this planet, we have found a starry sky beautiful. Because even the most jaded city-dweller, who has never before been under a truly dark sky, can gasp with astonishment at all the stars, I think we’re hardwired to enjoy the beauty of a dark sky sprinkled with thousands of stars. Whether you believe we find a star-filled sky beautiful because that sense is a gift given to us by a loving God or is the result of a long evolutionary development from our hominid ancestors (or both! ), the sense of beauty is there to be enjoyed. There are places in our nation that recognize that enjoying a dark sky filled with stars is a necessary part of a high-quality of life. These places have passed ordinances to reduce or eliminate unnecessary street and building lighting and shield the necessary light so all of the light goes down to the ground where we need it. The shielded lighting also saves money in the long run because we’re not paying for light going up in the sky. Another thing that is hardwired into us is our circadian rhythm: the natural cycle of biological and cellular processes of our bodies that is tied to the 24-hour cycle of light and dark. Lighting that has a true white or extra blue in it disrupts the secretion of the melatonin hormone that regulates wakefulness. Disruption of melatonin has been linked to various cancers, especially breast cancer. Diseases exacerbated by disruption of our circadian rhythm include obesity, diabetes, depression, mood disorders, and reproductive problems. That’s why my cell phone and laptop have a “night shift” function that gradually reduces the amount of blue and green colors on their screens after sunset. Who knew that the unshielded light bouncing off all the fine particulates in our air could be damaging our bodies? These aesthetic, economic, and biological health reasons give some incentive to being more careful about our city lighting. There are also negative effects from light pollution on wildlife. The International Dark-Sky Association (IDA) website at www.darksky.org is an excellent one to find out how to economically shield your light fixtures and how to find bulbs (including LEDs) that are below 3000 Kelvin in their colors. The higher temperature colors (5000K or higher) of many of Bakersfield’s city lights put out an excessive amount of blue light in their color mixture to produce a harsh white light with excessive glare that can actually make it less safe to drive. Intelligent city lighting would enable us to also enjoy meteor showers without having to drive a long ways. 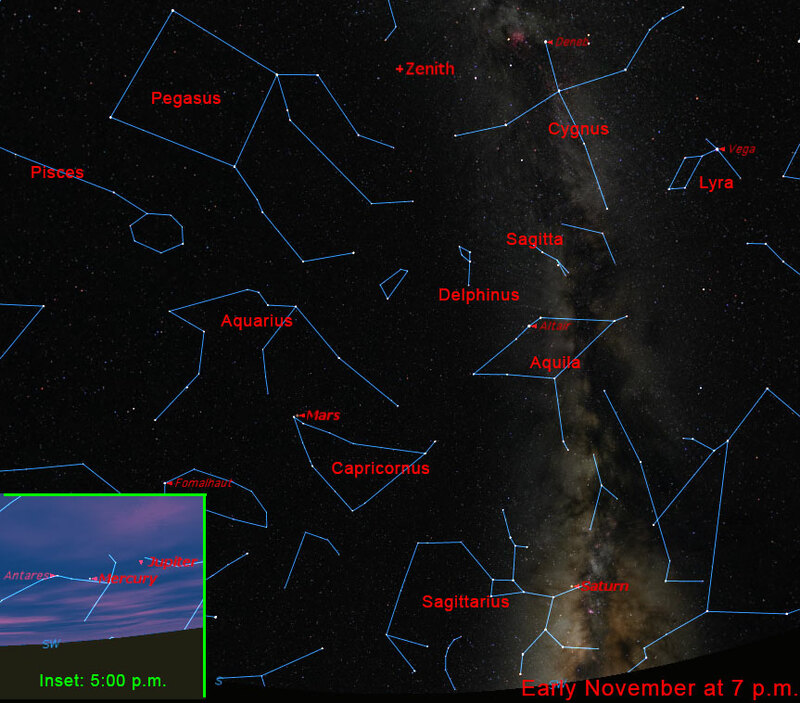 This month brings the Leonid meteor shower which peaks on the night of November 17/18. More meteors will probably be seen in the pre-dawn hours of November 18 because the Earth has rotated us to face head-on the dust stream left behind by Comet Tempel-Tuttle. The dust particles hit our atmosphere at 44 miles per second and burn up many tens of miles above the surface to produce the brief streaks of light we call meteors. In tonight’s sky, you may be able to spot Mercury low in the southwest shortly after sunset (see the inset of the star chart below). It’ll be near Antares at the heart of Scorpius. The BepiColombo spacecraft launched in late October by the European and Japanese space agencies is now heading towards Mercury. Although Mercury is not that far away, we do have to get rid of a lot of angular momentum to get to Mercury’s orbit. BepiColumbo will do this through a series of flybys of Earth, Venus, and Mercury over seven years before finally settling into orbit around Mercury in December 2025. With a dark sky you would be able to see the Milky Way which goes down the middle of Cygnus near the zenith at 7 p.m. Mars is in the south direction at the left tip of Capricornus at that time (see the star chart below). The Mars InSight lander will land on Mars near the end of this month on November 26. It will have a suite of instruments to explore the interior of Mars as described in my May 5 column archived on the Planetarium’s website at www.bakersfieldcollege.edu/planetarium .